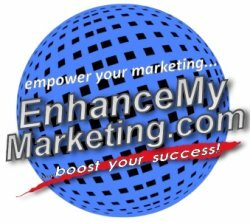 EnhanceMyMarketing.com is about empowering individuals and businesses, providing powerful and proven marketing and SEO insights, tools, links to boost your success. No Gimmicks. Nothing to Buy. Just straight-forward advice to improve your marketing, PR, and SEO efforts. Hope you're here to learn about marketing, whether for yourself (personal/career branding) or your business (large or small). The mission of this site is about empowering your marketing efforts by providing powerful marketing, public relations (PR), and search engine optimization (SEO) insights, tools, and links -- all to boost your success. Read more about our mission and the site's founder.